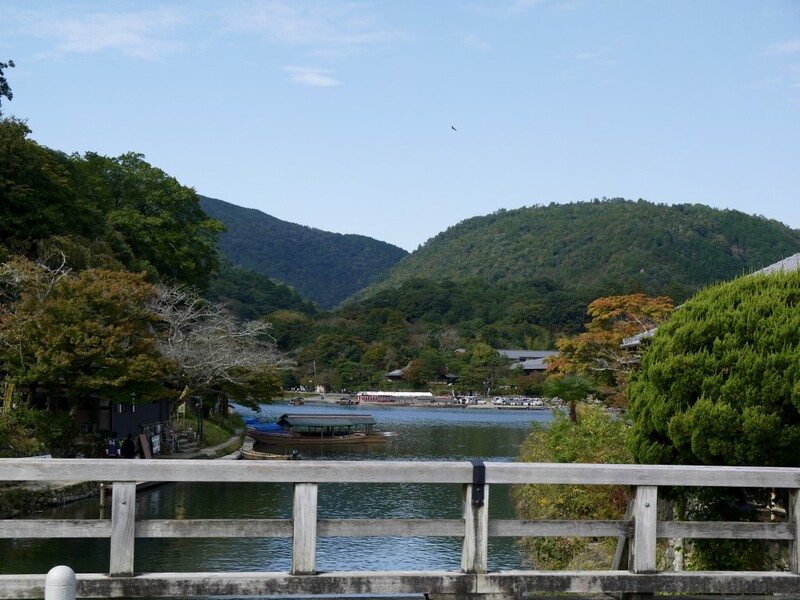 Arashiyama is undeniably a magical site offering ample examples of the scenic beauty Kyoto is known for. However, unlike other areas of the city it is perhaps less frequently associated with fine dining. While, if you follow the red book religiously, you’d probably venture out there for the incredibly expensive three starred meal at Kitcho, that’s probably the only establishment on most foodie’s list. 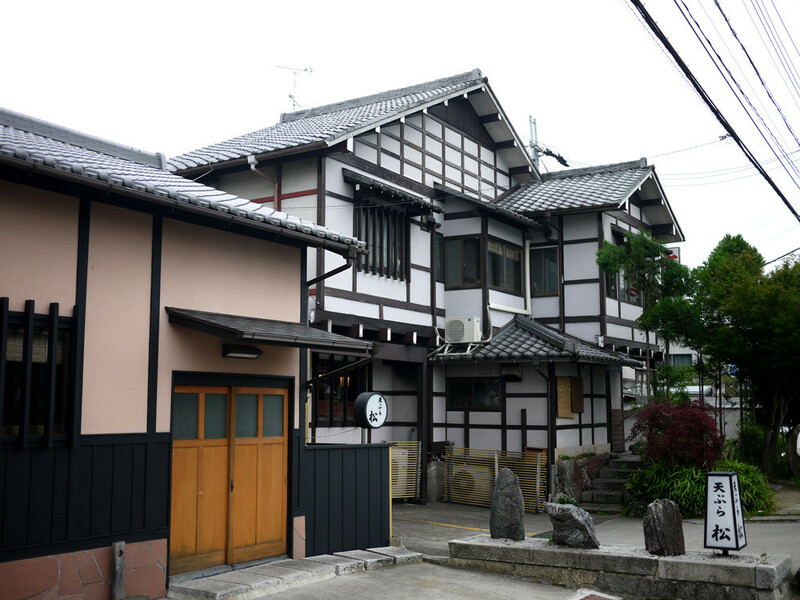 One would therefore be forgiven for not having heard of Matsuno Shunichi’s restaurant, Tempura Matsu, located a couple of kilometres down the Oi river in the neighbourhood of Matsuo Taisha since 1973, but you would certainly be missing out. The restaurant is a well kept secret amongst the locals and is often booked out by Japanese politicians. It does however appear to have started attracting some foodies from afar. But don’t let the name deceive you. Whilst tempura certainly does make it on the menu, the cuisine here is traditional Japanese (washoku) with some surprisingly modern and creative twists. 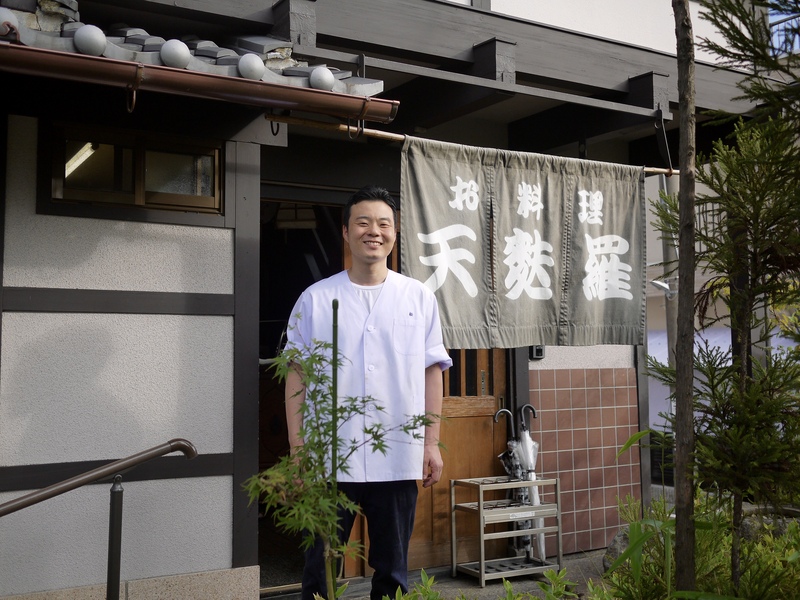 This can be easily explained by looking at the CV of the current chef, Matsuno Toshio, who took charge of his father’s restaurant a few years ago. Toshio has an impressive resume working with such icons as Alain Ducasse and Grant Achatz. We were fortunate enough to have a private room upstairs. This allowed us (and most importantly, our two year old daughter) a bit of privacy and room to move around. Given we had travelled all the way to Japan, we opted for the most elaborate menu containing the best ingredients available at 15,000 yen per person; an absolute steal considering the feast we were about to indulge in. Many of the courses were also served on oribe ware (a style of ceramic ware with vivid colours) produced by one of Japan’s most important artist Kitaooji Rosanjin (北大路 魯山人). Some of his works have been declared as national treasure by the Japanese government and are absolutely priceless fetching tens and hundreds of thousands of dollars for each piece. What an absolute honour to be able to use and admire them up close! 1st Course: Corn soup, scallop, water shield and prawn in bamboo cup. 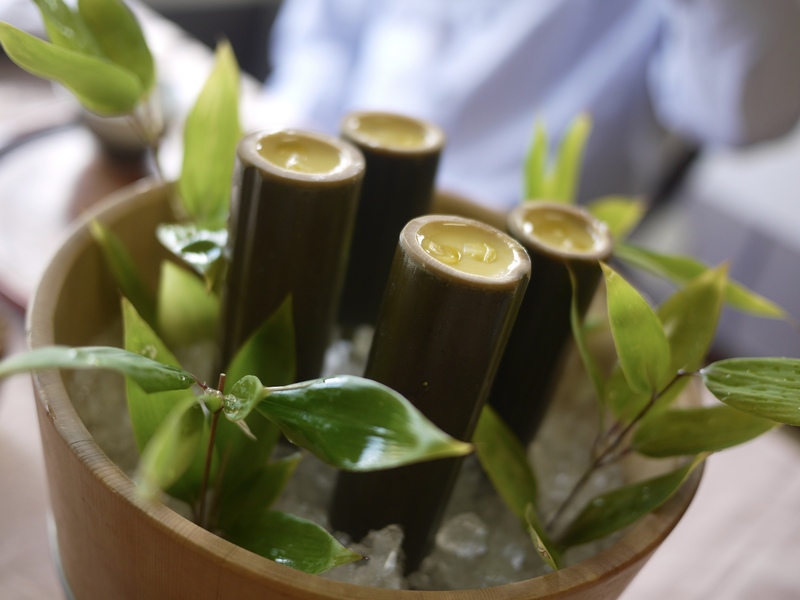 The bamboo cylinder was filled with a sweet corn soup, generous portions of scallop and prawn and slithers of water shields (also known as junsai in Japan) and chilled in the ice bucket to make this a rather refreshing starter. I particularly enjoyed the transition from the sweet flavour to a more sharper finish with the junsai which had been pickled in vinegar. 2nd Course: Sweetfish (Ayu). 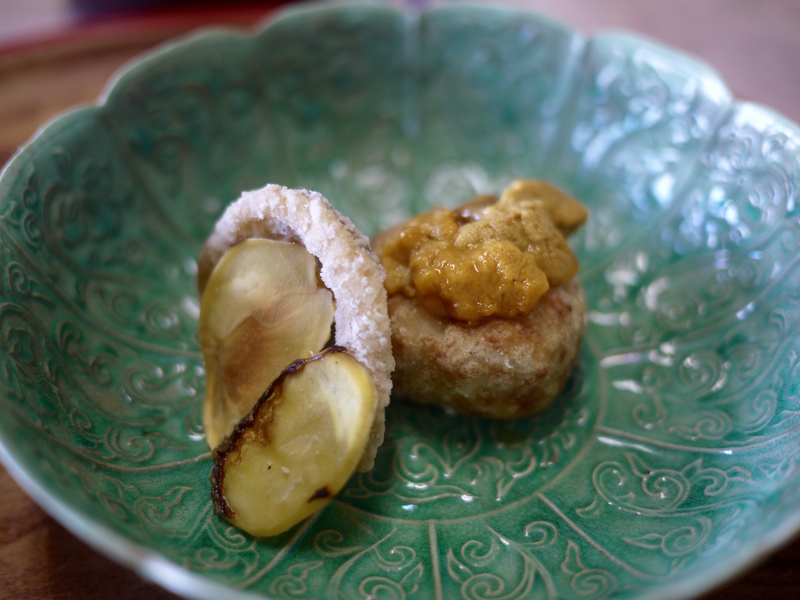 The last ayu of the season which contained delicious roe was presented in two ways. Firstly, as a sushi and secondly, prepared using a charcoal grill, or sumibiyaki. The green sauce was made from ayu that had been preserved in salt and vinegar from last year with water pepper leaves. 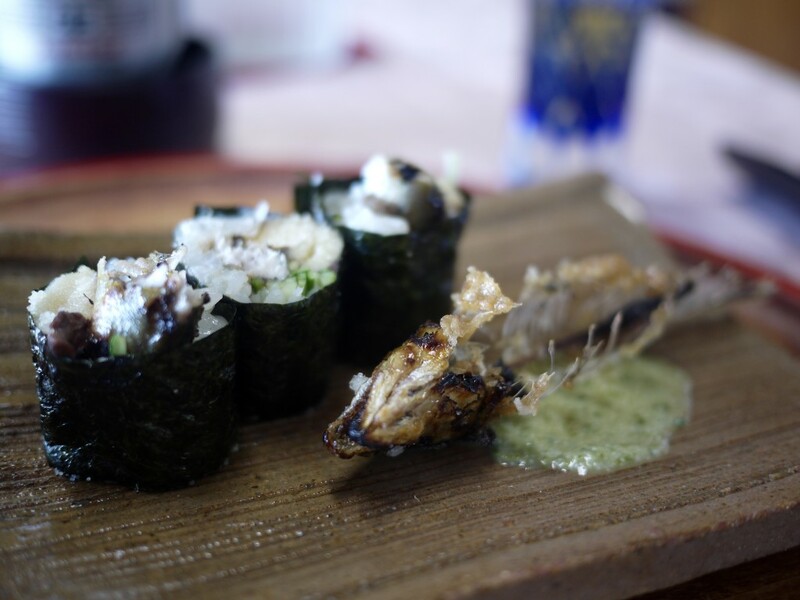 The sushi was exquisite and sweet but my favourite was the salt grilled ayu. The entire fish could be consumed right from the head to the tail. Crunchy, crispy, sweet and savory. 3rd Course: Prawn potato (Ebi imo), pike conger (hamo) and sea urchin (uni). The ebi imo is a unique variety of the taro potato and was served with deep fried hamo and a slither of uni, both sourced from Awajishima in the Hyogo prefecture, and chestnut chips. It was seasoned with salt from Okinawa. It was another well balanced dish with varied textures and flavours. 4th Course: Matsutake Dobinmushi. 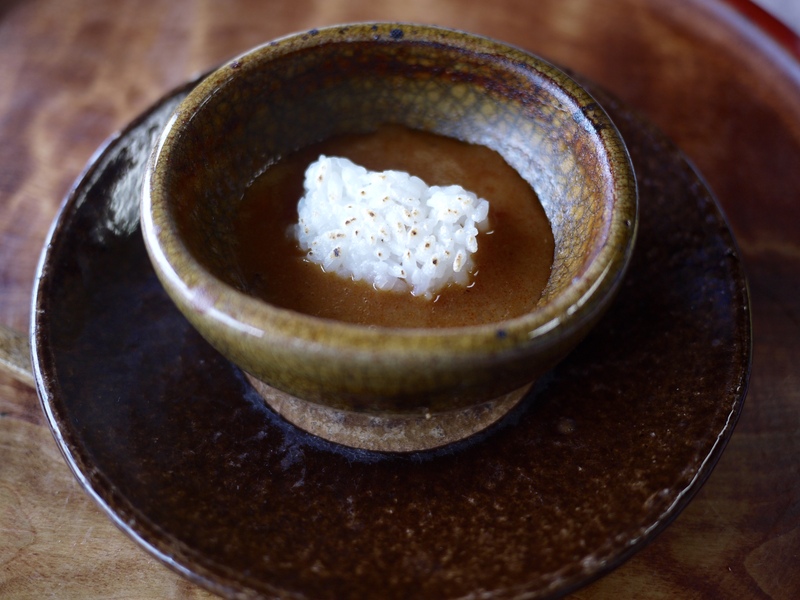 A traditional but luxurious course serving the prized matsutake mushroom which was coming to the end of season. 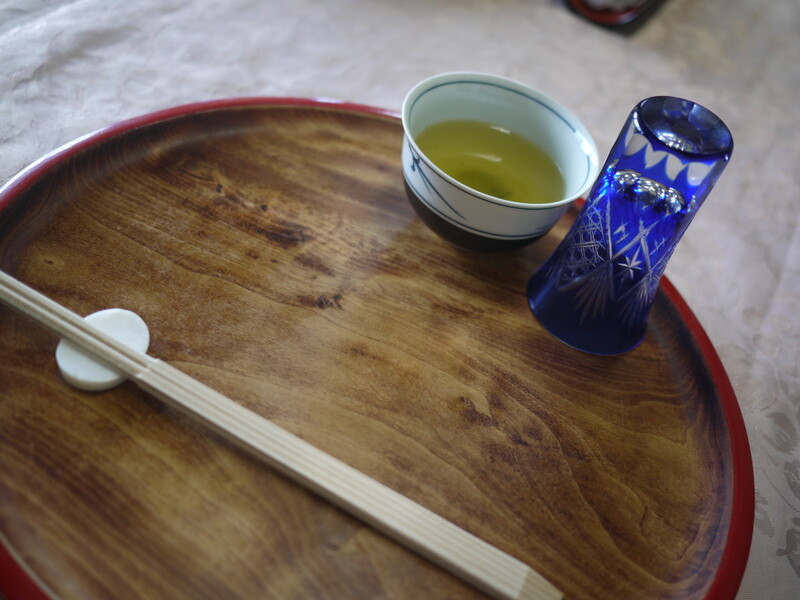 A teapot was presented to each person with a sake cup that had been sprinkled with yuzu zest and a slice of sudachi on the side. 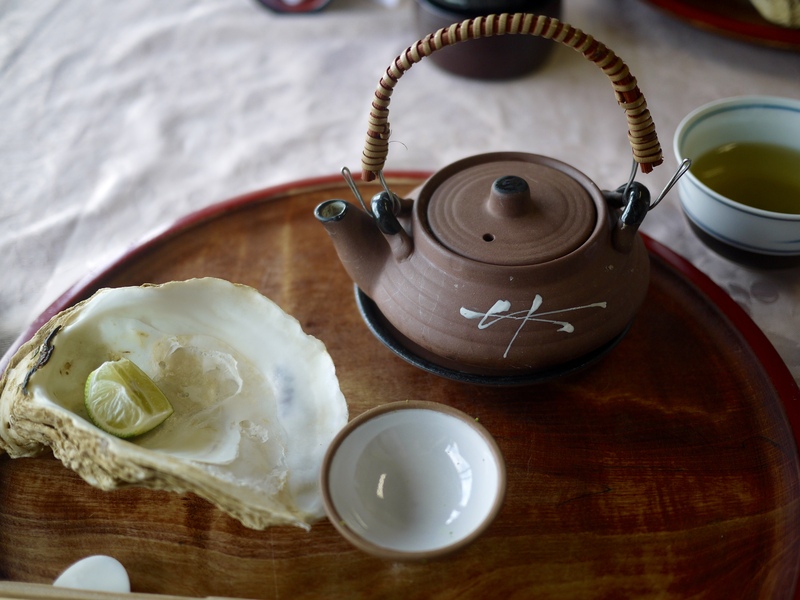 Inside the teapot were oysters and matsutake. 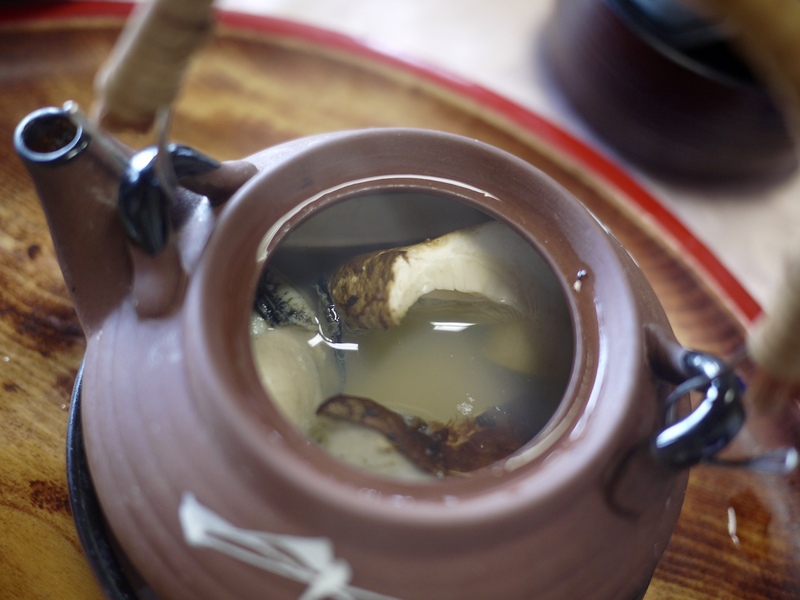 We were advised to first pour the broth out into the cup and drink it, before moving on to squeezing the sudachi over the matsutake and oyster before eating them. 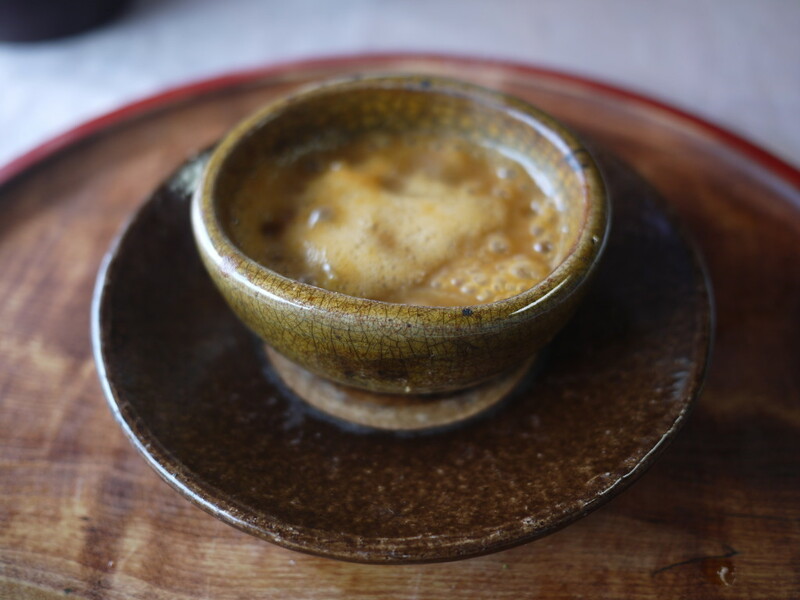 The broth was absolutely exquisite – a perfect marriage of flavours from the mountain and the sea. 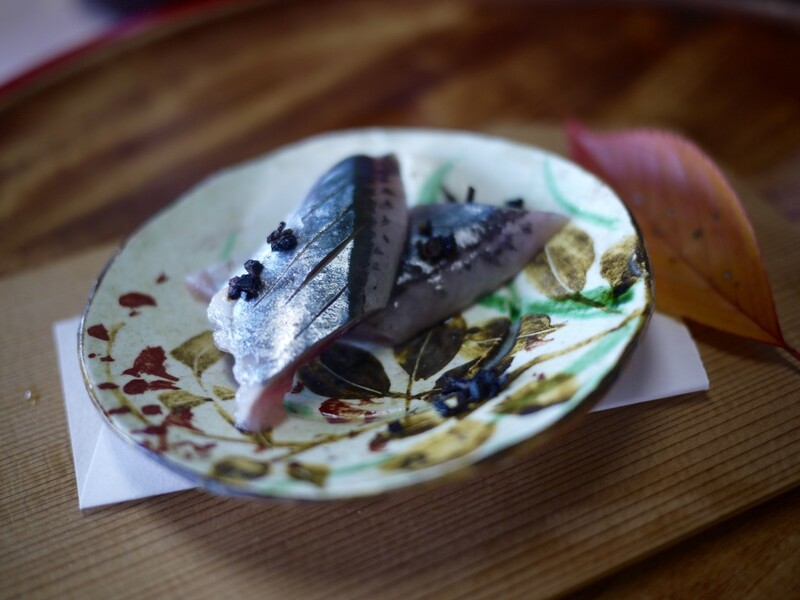 5th Course: Pacific Saury Sashimi (sanma), served simply with a pinch of salt. Don’t let the simplicity of this dish fool you. This was simply the best sanma I have ever tasted and surpassed all expectations. I personally preferred my sanma grilled with salt but this sashimi just melted in your mouth like butter. The Absolutely divine. 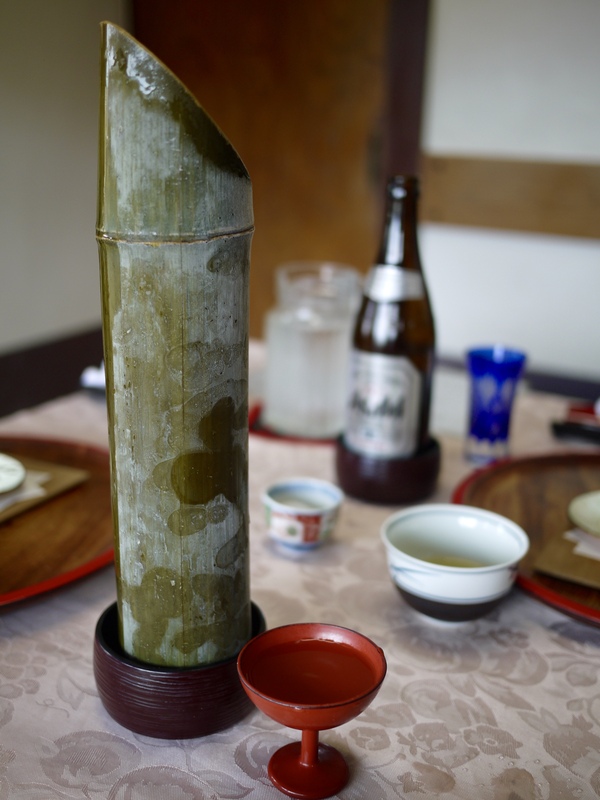 We thought it would be a shame not to have some beverage to go with our food that was more fitting than beer so opted for the finest junmai daiginjyo called ‘gesshou’ which was a limited release and was served in a chilled bamboo flask. 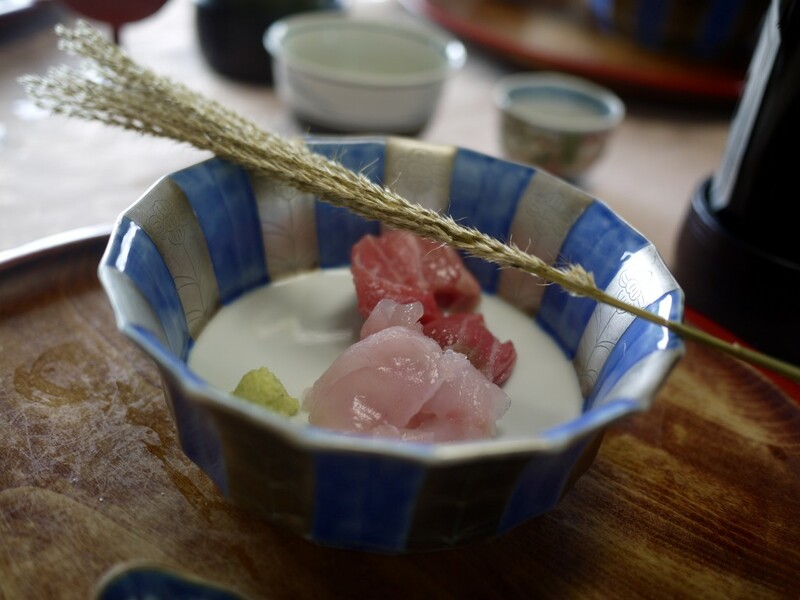 6th Course: Tile Fish (Amadai) and Fatty Tuna (Ootoro) Sashimi. The pampas grass (susuki) on the bowl is a typical decoration used during the months of moon watching (tsukimi). The sashimi was served with seaweed soy sauce on the side (nori jyouyu). It was a showcase of the superior produce and ingredients Japan has to offer. 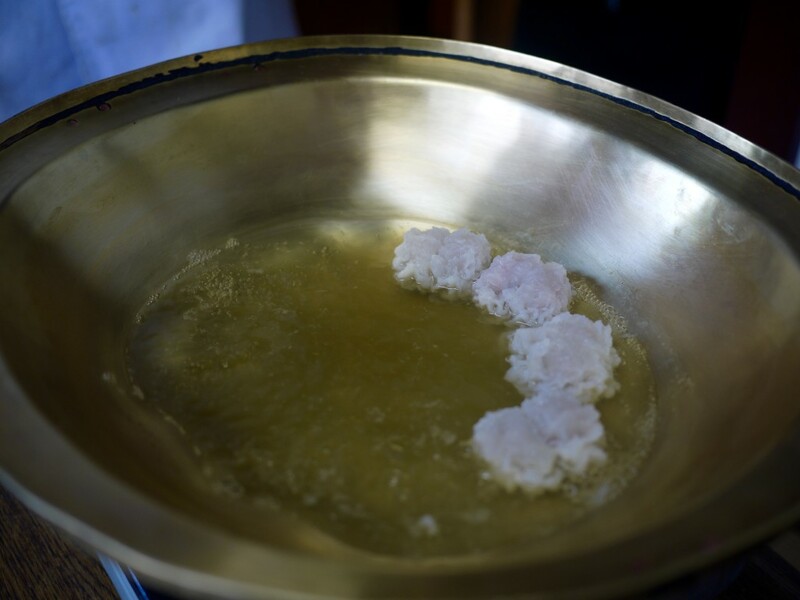 The amadai or, as also locally, guji is considered to be the fish that represents Kyoto and is highly sought after for its sweetness. We were advised to eat the fried scales of the amadai after the sashimi. This was the perfect snack to go with the sake. 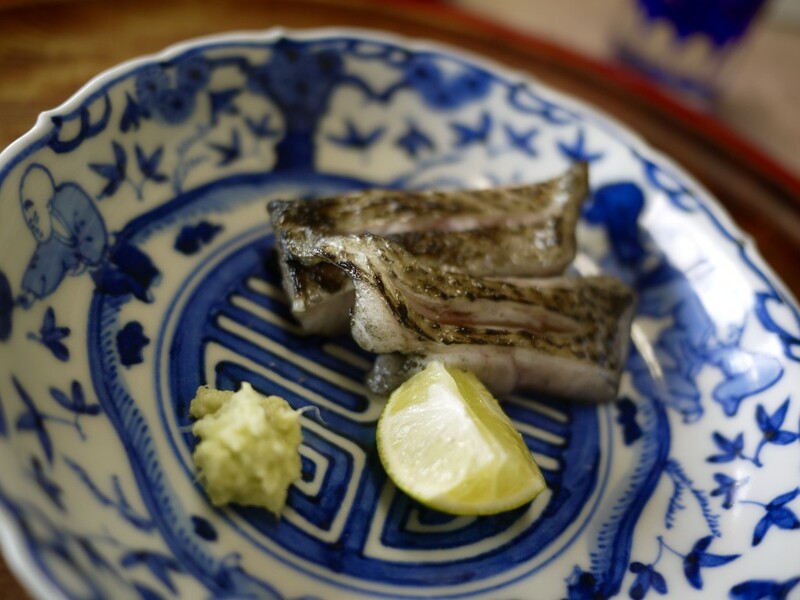 7th Course: Seabass (nozoguro), slighted torched and served with wasabi and sudachi. It had an intoxicating smokiness and melted in your mouth all too quickly. The direct application of the wasabi was ingenious. 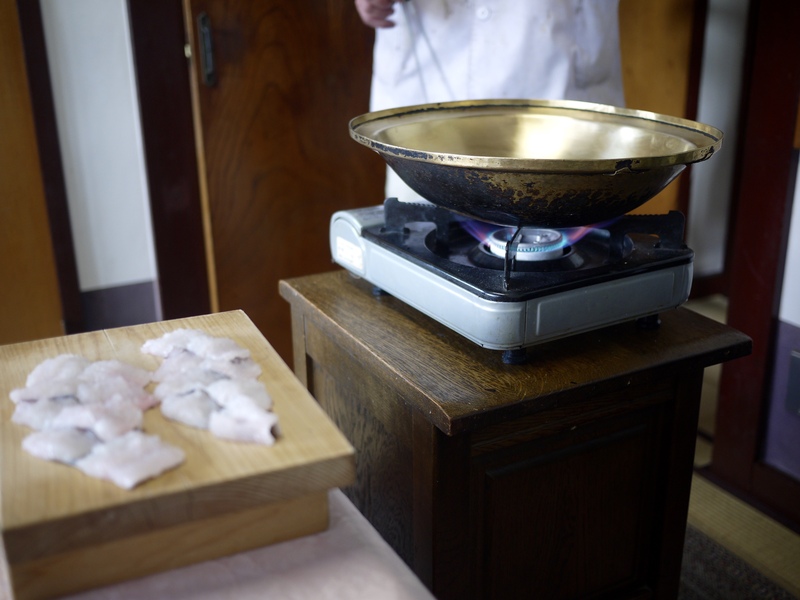 It eliminated the charred smell, focused on the smokey flavour and cut right through the oiliness of the fish. 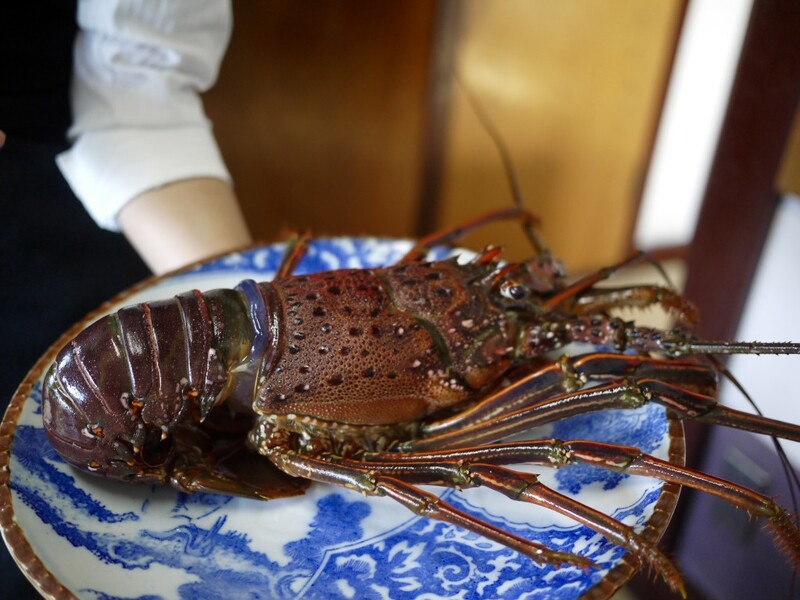 A Japanese spiny lobster (ise-ebi) was brought to our table alive again to showcase the superior quality of their ingredients. Japanese people go bonkers over these crustaceans at the height of the season. I certainly got excited as it had been a while since I had one. 8th Course: Ise-ebi shabu shabu. 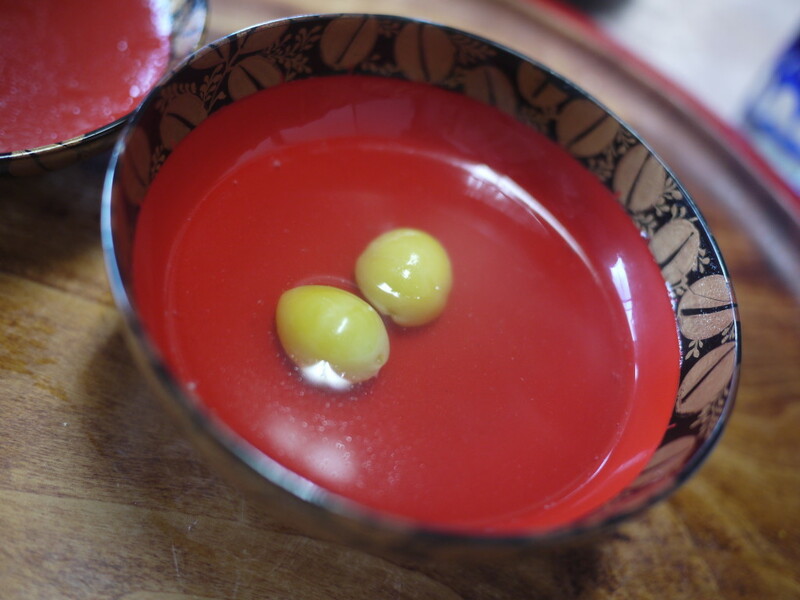 A decadent and luxurious rich soup made from the head of the ise-ebi was presented to each of us in a bowl. The aroma from this was unbearably good and I had to hold myself from immediately picking it up with my hands to slurp it – fortunate given the bowl was scorching hot. 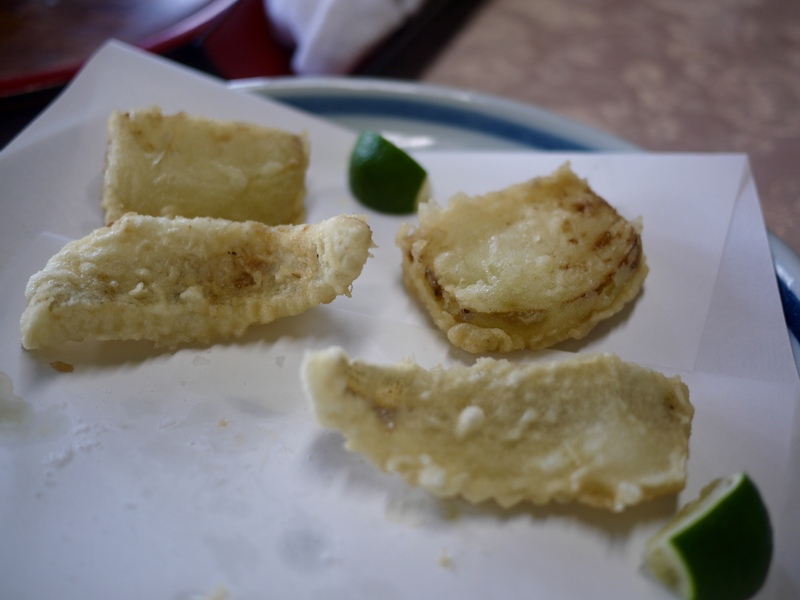 Each person had a portion of the ise-ebi and two thin sheets of tofu skin, otherwise known as yuba. 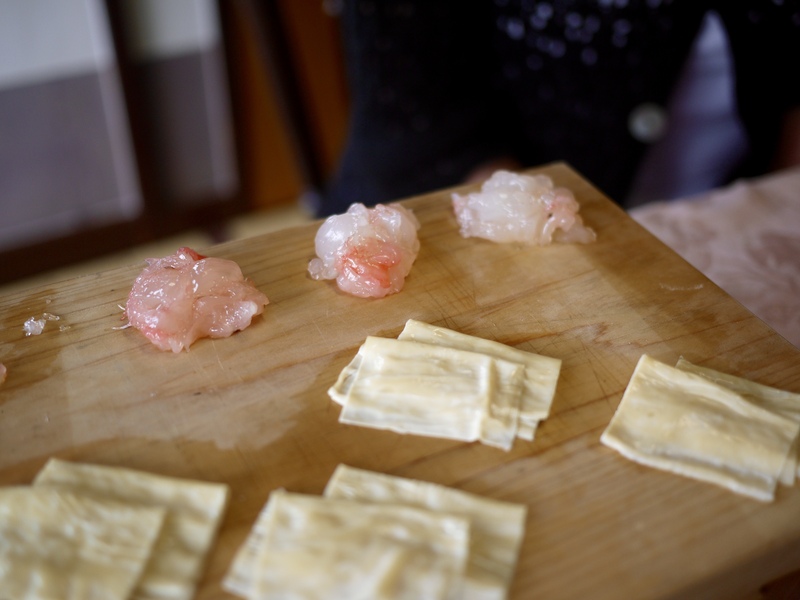 The sweet ise-ebi and yuba soaked up the flavour of the soup. It was unbelievably sweet and euphoric. The last time I had such an array of exquisite courses one after another was at Matsukawa over two years ago. But this was at less than a third of the price. 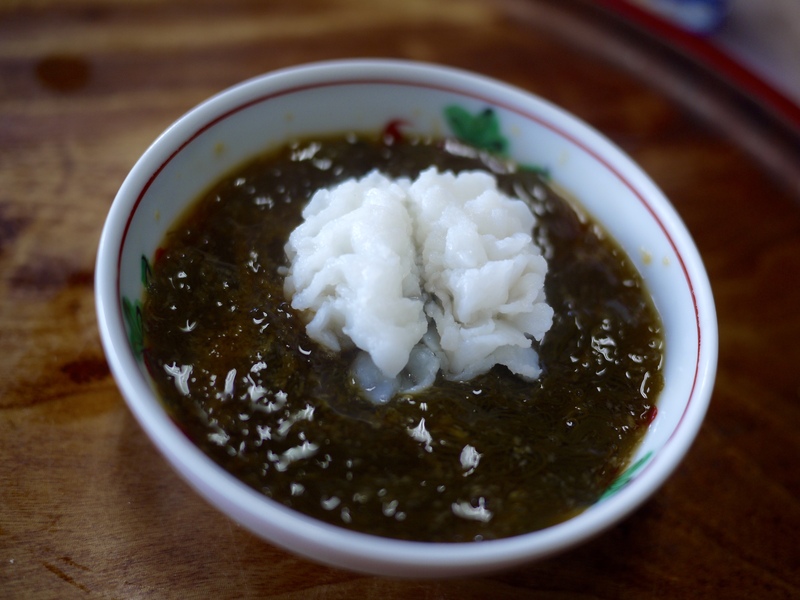 A small grilled rice ball, or yaki onigiri was brought afterwards to soak up the rest of the soup. This was comfort food for the ultimate foodie and it was great to see that the chef was humble enough to serve such a common touch. After all, this was the equivalent of having a great bread in Europe to mop up the sauce. It was very gratefully received. There was no way I was wasting even one drop of this delicious dish. 9th Course: Pike Conger (Hamo) shabu shabu with mozuku seaweed and dipping sauce. 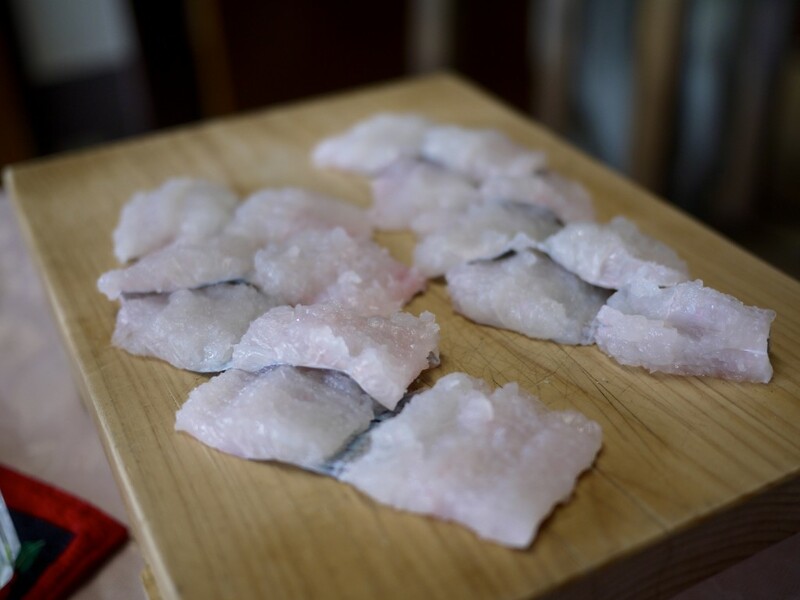 The hamo, sourced from Numazu had been prepared using the traditional technique of honegiri which requires a skilled chef to break the hundreds of tiny bones in the fish without breaking the skin. A shabu shabu set was brought right next to the table for the chef to prepare. I thought perhaps two shau shabu was overdoing it but boy was I wrong. This was on par with the shabu shabu of the matsutake and hamo which I had at Matsukawa. The hamo was cooked in shallow fashion in order to ensure it was not overcooked the top side to retain its soft texture. A delicate fish like hamo can easily be overcooked so this technique ensured the fish was treated with the most respect. 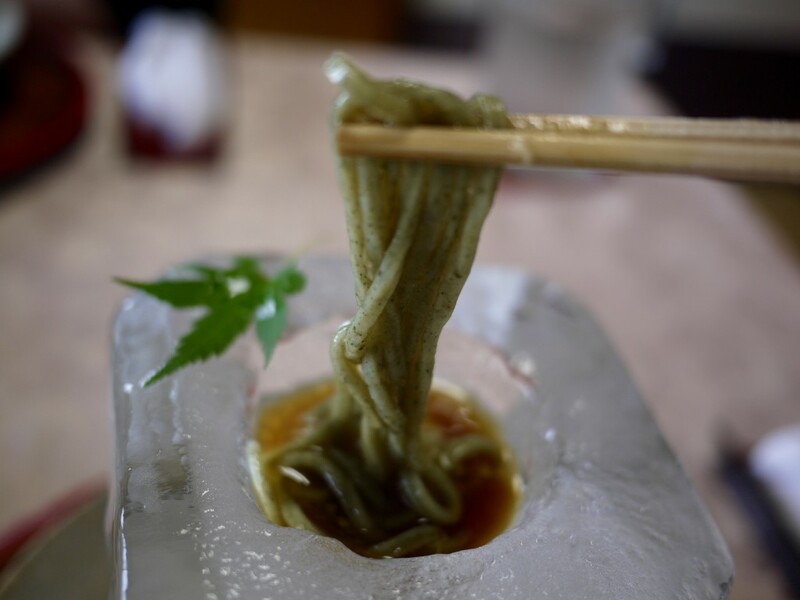 Mozuku is a seaweed from Okinawa which has a jelly like texture not too dissimilar to jellyfish. The final product was another winner. It was a shame we only got two pieces! 10th Course: Pike Conger Dashi which was made from the remnants of the previously presented hamo and was served with gingko nuts. Nothing went to waste here and I admired the chef’s respect for his ingredients. Amazing aroma and flavour from such a simple looking soup. 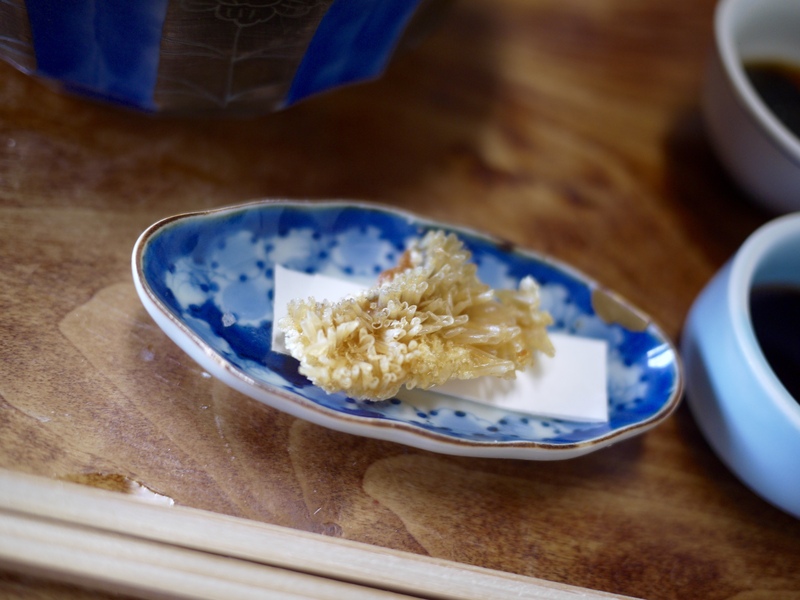 11th Course: Prawn and lotus root tempura served with the option of salt and sudachi. Of all dishes I expected this one to be amazing given the restaurants name… luckily they lived up to it. 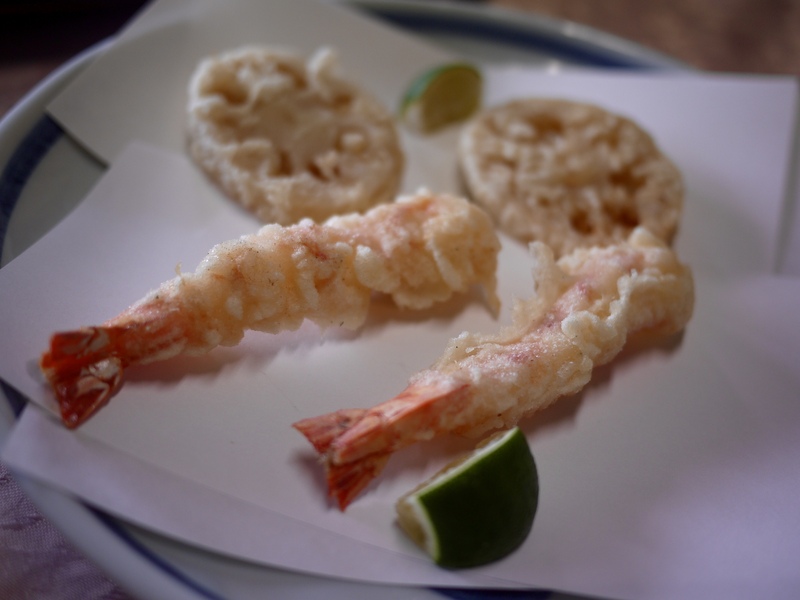 The tempura was light and without oiliness. The prawn was juicy and cooked perfectly. A second plate of tempura of Japanese whiting (kisu) and onion. The onion in particular was remarkable with its sweetness and juice. 12th Course: Udon. Home made udon was served in a giant ice cube with quail egg, mountain potato and dashi. This required a couple of people to serve given its size, slipperiness and weight. It was certainly entertaining and very theatrical. 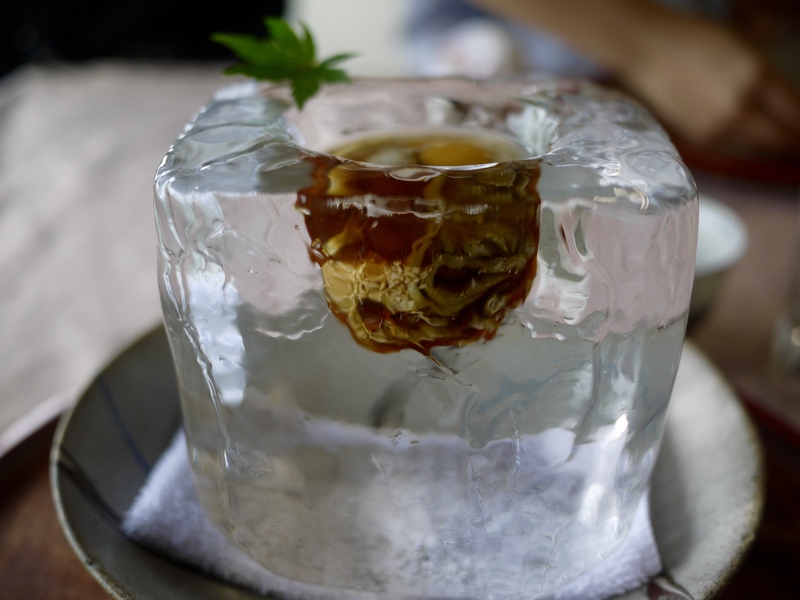 The ice cube was an idea that came to the chef when he wanted to find a way for his diners to enjoy the rich dashi stock instead of wasting it. 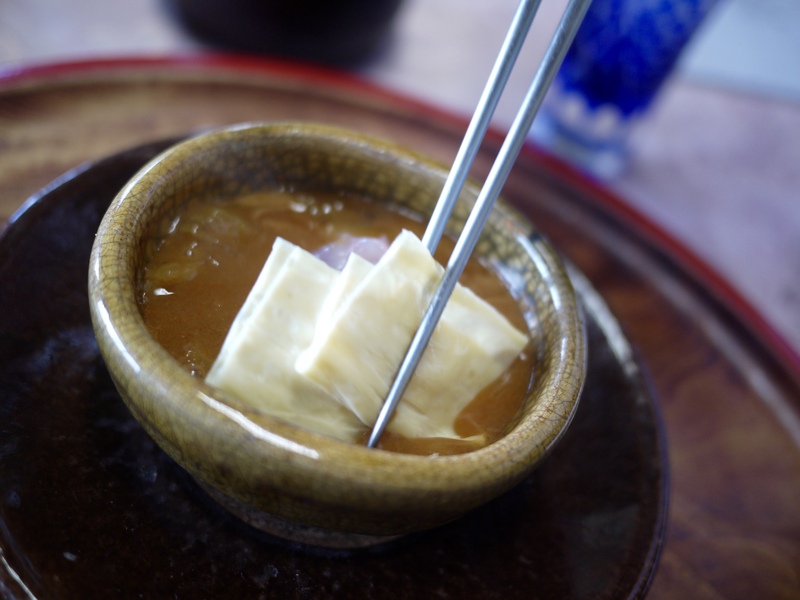 Depending on your personal taste you were advised to let the dashi sit longer in the cube to allow the melting ice to dilute the stock. It was quite remarkable as to how much the flavour changed during the ten minutes. Flavourwise I wasn’t convinced on this one. It was perhaps less flavoursome than everything else we had that evening and I found the quail egg to be slightly bland in the rich dashi. The texture of the udon was good but again nothing outstanding. It was a very fun dish however. 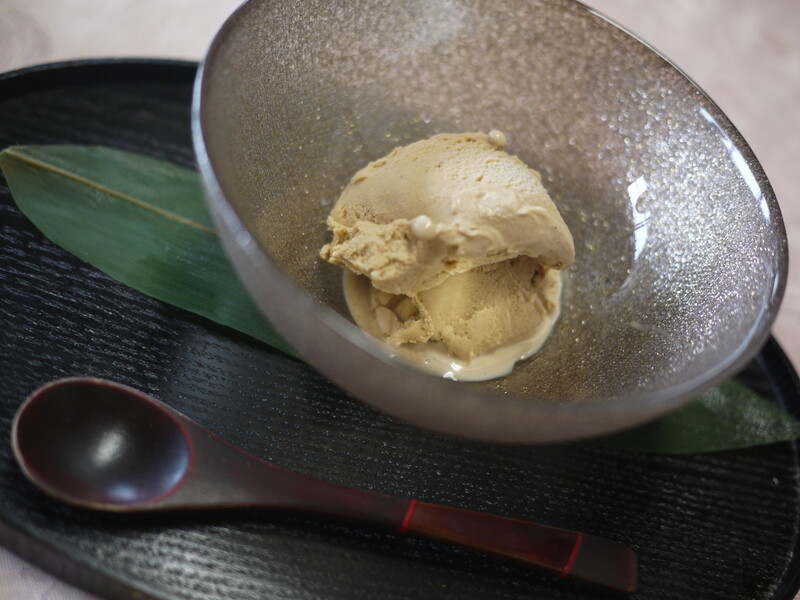 13th Course: Houjicha ice cream. A good ice cream which cleansed our palate. Whilst it was perhaps lacking in creativity, we were stuffed at this point and welcomed the light dessert. Our meal at Tempura Matsu was without a doubt the highlight of our trip and almost on par with my most memorable Japanese meal at Matsukawa. The quality and variety of ingredients was simply remarkable, particularly given the affordability of the meal compared to many establishments in Kyoto that would easily charge you two to three times without batting an eyelid. As we made our way out, Matsuno-san came out to thank us for our custom and bid us farewell. I will not be forgetting this meal for some time to come. It was a magical four hours that went by at a perfect pace. This entry was posted in Asia, Japan and tagged Arashiyama, Hamo, ise-ebi, Japan, Kyoto, Matsuno, matsutake, sanma Toshio, shabu shabu, Tempura Matsu, Washoku on April 25, 2017 by admin.